On the southern side of the famous Club Row in central London, there sits a Victorian building of classic beauty. This is where the Reform Club, one of the prestigious clubs in London, is located. Speaking of the Reform Club, many people think of the famous Around the World in 80 Days written by the French author, Jules Verne, with both the beginning and end set here. Established in 1836, the Reform Club, with the aim to advocate freedom, reform and progressive thought, was originally composed of members of the Liberal Party in the British Parliament who supported Reform Act 1832. At one time, the former British Prime Minister Sir Winston Churchill was also a member of the Club. Today, the Reform Club has developed into an important forum for British politicians and scholars to exchange and share ideas. On the evening of 20 November, the office building of the Reform Club was brilliantly illuminated, and fine dressed guests gathered in the hall. These guests are celebrities of various circles in the UK and members of the political committee of the Club, who share a common mutual interest in "Reform". Today, one cannot talk about reform without mentioning the reform in China and its implication for the UK and the world. Tonight, in high anticipation and fully prepared, they have come to listen to Ambassador Liu Xiaoming talking about reform in his speech under the title Comprehensively Deepening Reform Provides a New Driving Force for China's Development. 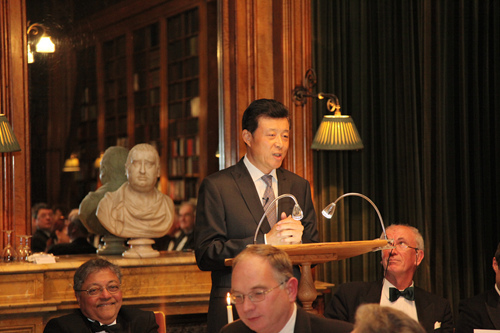 The speech of Ambassador Liu was connected closely to the name and tradition of the Reform Club, centering around the theme of reform. Ambassador Liu started his speech talking about the tradition of the Reform Club for advancing reform and reviewed China's reform and development in the past 35 years since the Third Plenum of the 11th Central Committee of the Communist Party of China. He emphasized that reform has changed China and enriched China. Next, he used three English words that begin with capital D, Determination, Design and Deployment to do a three dimensional analysis of the interpretation and analysis of this Plenum and the reform plan it has set out. Ambassador Liu pointed out the signals from this Third Plenum indicate that China will discard outdated ideas and shatter the grip of vested interests. Reform should strengthen the combination of 'top-down design' and 'crossing the river by feeling the stones' to optimize decision-making. A key area among all these is economic reform. The key of this issue is to have a proper relationship between the government and the market. Such a relationship should allow the market to play a decisive role in allocating resources, yet at the same time enable the government to play a more effective supervisory role. Ambassador Liu pointed out that the Third Plenum has sounded the clarion call for a new wave of reform in China. The reform in the past thirty five years has lifted China out of poverty and backwardness. Now, the second round of reform from this Third Plenum will realize the great revitalization of the Chinese nation. The reforms will make true for China's 1.3 billion people – the 'Chinese Dream'. He took the example of the long evolving process of the British modern parliamentary system and emphasized that reform cannot be accomplished at one stroke, nor can it be done once and for all. Reform is an ongoing process and institutions need constant updating. So what does the comprehensive deepening of reform in China mean to the China-UK relations? Ambassador Liu pointed out that the sweeping reform in China will powerfully drive China's development. Moreover, these reforms will bring new and greater opportunities for China-UK cooperation, significantly promoting exchanges and cooperation between the two countries in trade, finance and culture. Ambassador Liu said that British Prime Minister David Cameron will visit China. The two sides will update each other on their respective views and experience of reform. There will be in-depth discussion on the new openings brought about by reform in both China and UK, and jointly draw up a blueprint for the future of China-UK cooperation. In conclusion, Ambassador Liu said that just as Britain endured the difficulties and setbacks of the Great Reform Bill of 1832, with the end result turning out to have splendid significance in history, China's comprehensive reform must endure and resolve difficulties. But the end result of the reform is destined to be very great, and will generate an important and far-reaching influence. Likewise, we need to make relentless efforts and overcome obstacles of various kinds to further advance China-UK relations. However, I am confident we can positively advance if we follow the principles of, mutual respect, treating each other as equals, seeking common ground while putting aside differences and working together for win-win outcomes. With these principles we will be able to find a path for China and UK to forge a new type of relationship between big countries. Deep and various ideas were explained in simple ways in this thought-provoking speech by Ambassador Liu. The audience nodded in agreement with Ambassador's views and gave warm applauses from time to time. After the speech, the audience raised a lot of questions and Ambassador Liu answered them one by one. One guest asked in view of the tight and extensive role of Chinese government in the economy, how will China deal with the relationship between the government and market in the future? Ambassador Liu said that on the one hand, the Chinese government will decentralize more powers to the market and achieve maximum benefits and optimal efficiency through market competition. On the other hand, the government will improve its role in maintaining the stability of the macro economy and guaranteeing fair competition in order to prevent market failure and promote sustainable development and common prosperity. On the question of how to solve the problem of uneven development in China, Ambassador Liu said after the 35 years of development since the reform and opening-up, China has become the second largest economy in the world, but it is still confronted with serious challenges such as imbalanced and uncoordinated development. The new leadership has worked in grass-root and local units and has a deep understanding of the importance of promoting balanced development and social justice. The Chinese government will strengthen support to the central and western regions of China, advance the development of urban and rural integration and improve income distribution system so as to ensure that the fruits of the reform and development are fairly shared by the entire society. On questions about reforms of the one-child policy and pension system, Ambassador Liu said China is a country with a large population. Thanks to the one-child policy, the population of China is 1.3 billion; otherwise, the population now would have reached at least 1.7 billion. As China grows stronger, problems such as aging and decrease of demographic dividend have become more prominent. For this reason, the government should adjust the one-child policy and promote long-term balanced development of the population. At the same time, the government should also vigorously advance reforms in the pension system, including improving old-age services and developing the service industry for the caring of senior citizens. 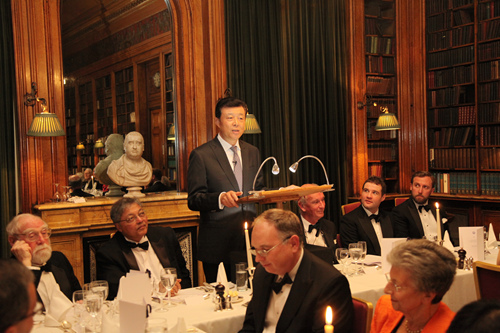 In dealing with an aging population, he believes that China can learn a lot from the UK. Ambassador Liu also answered other questions from the audience on the development of Tibet, China-US relations, China-EU relations, China-UK relations and cross-strait relations. Time passed very quickly and the question time went much longer than expected. When the hosts called an end to the question time, there were still four or five people raising their hands. 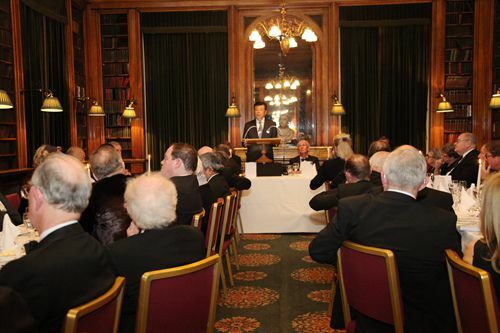 In conclusion, a representative of members of the Reform Club delivered a speech. He said that Ambassador Liu's speech was very impressive and inspiring. The reform scheme, established at the Third Plenum Session of the 18th CPC Central Committee, covers a wide variety of areas and a thorough and specific content, presenting the courage and wisdom of the new leadership of the Chinese government. Once finished, the achievements will not only exert far-reaching effects on the future development of China, but will bring more confidence and opportunities to the world. He believes that the new round of China reform will yield more development dividends to China and the UK and inject more vitality to the development of China-UK relations.